These little boxes were sent to Amy last week. I adore how everyone takes such care to wrap their packages - isn't that half the fun??? The packages look so enticing--I can hardly wait! 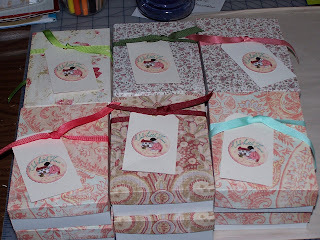 I was glad to see how beautiful all the packages looked on the blog BEFORE I sent mine. Yikes. Those are pretty. Oh oh oh,,,, I am still working on mine. But they will be off in the post by Wednesday...Priority....I promise!